The hostel in Fethiye was full, but they let me sleep on one of the hookah-smoking platforms on the covered terrace for half the price, so I woke to a view over the Aegean as the sun lurked below the mountainous horizon. That’s a good way to start a day. 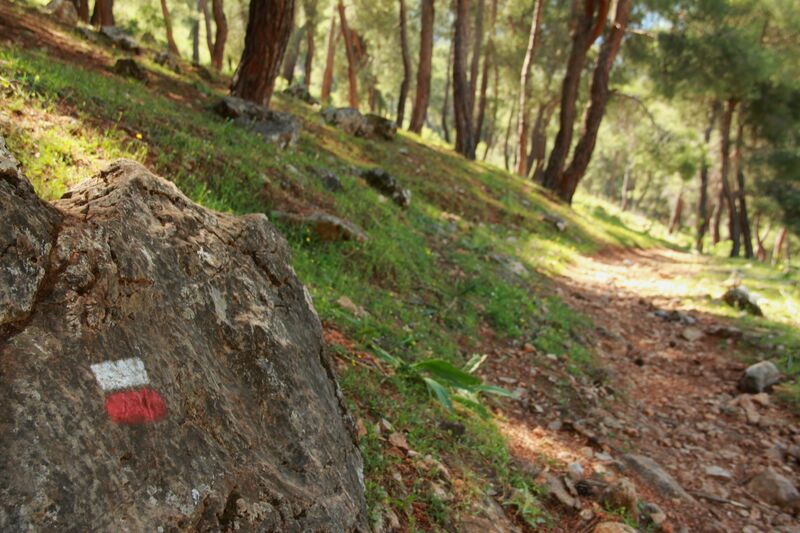 A good way to keep it going is a nice long walk through sun-soaked Turkish pine forest. So I did that. After World War I, civil war broke out between the Greek and Turkish speaking populations in Anatolia, and religious differences made sure it was vicious. A 1923 peace treaty included a forced exchange of 1,200,000 Greek-speaking Christians for 400,000 Turkish-speaking Muslims between the areas that became the two countries. 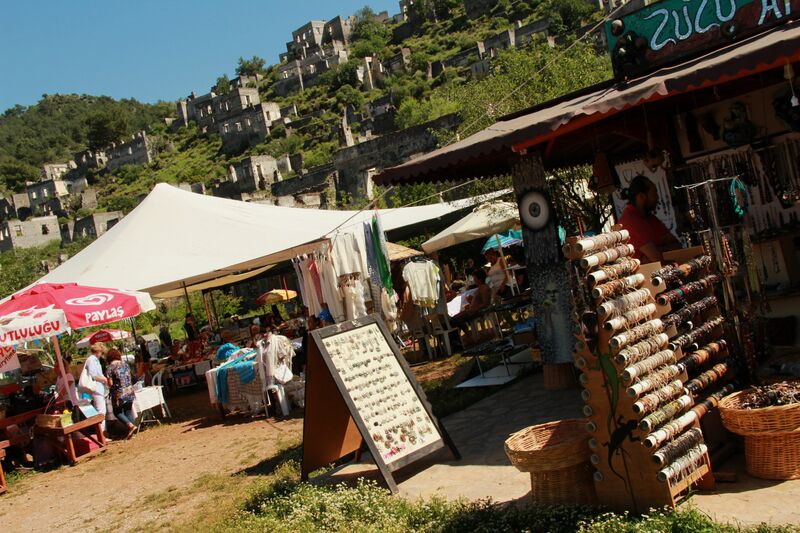 Until a few years ago there was a woman living outside the town of Kayaköy, a few miles from Fethiye, who remembered helping carry her friend Maria’s possessions down to the boats, and kept a chest they couldn’t carry for the rest of her life, just in case her friend should return. 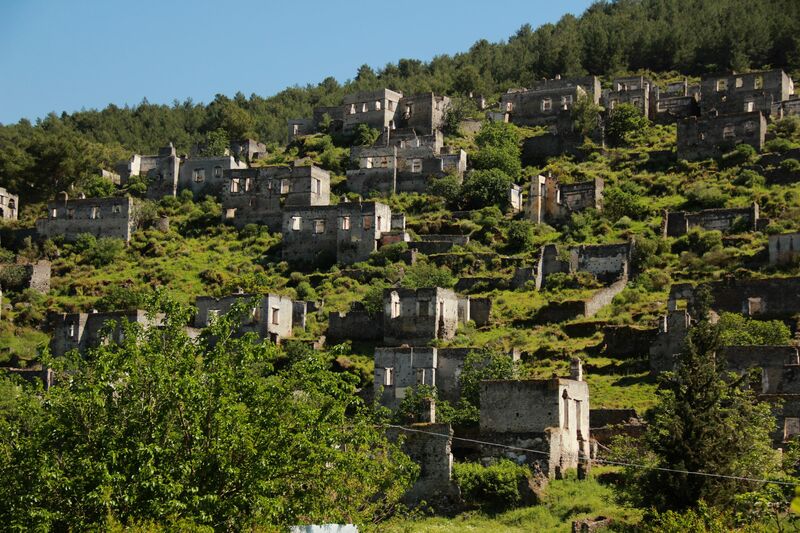 The people who resettled in Kayaköy were farmers who needed land but found the area unacceptable, and after a few years the town was abandoned. An entire abandoned town? Sounds like a destination worth walking to. I started on the 9 kilometer walk, delighted to find a trail which alleviated walking for two hours along the side of a busy road. The music was good (it’s now the soundtrack for my walk, not just Gladiator), the sun was warm, and my legs felt invincible. Travelgasmic, if you don’t mind the term. 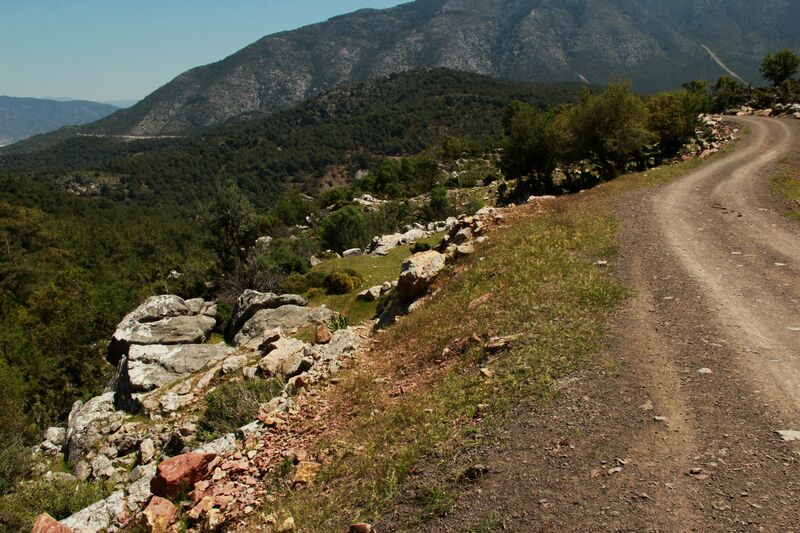 I was enjoying myself so much, that in a fit of adventurous optimism I decided to explore a side road with the hope that it too would lead to Kayaköy. After at least an hour of tortoises, dung beetles, and old women in bright headscarves herding gnarly sheep over rugged terrain, I came around a bend in the road to see my path extending out in front of me. And out. And out. It curved back and reached the horizon way off in the wrong direction. Nine Inch Nails’ song “Corona Radiata” came on, and I thought I was going to die. I hate backtracking, but I like living to see the next day. I was still resisting turning around when I found a fountain-thing, with a pipe pouring water straight out of the hillside. There was a glass on top, so I took the vote of confidence and filled my water bottle. Turned out to be a good call, since the two-hour walk would take me nearly five. I worked my way back, and descended the other side of the ridge, seeing the cluster of lifeless gray buildings approaching on the other side of a shallow valley. A tourist kitsch bonanza has grown up at the base of the “abandoned” town, and I was having trouble finding my way through it and into the actual crumbling streets when a car suddenly backed up right next to me. “If you run me over, I’m gonna be pissed…” I muttered, until I saw that it was my adopted Turkish Grandpa and family. Gramps! They showed me where I could ascend the slope, then went on their guardian angel way after Grampops made sure that I had found a good place to stay. The town was not much to speak of, and the glaring sun was beyond my skill to produce any good pictures, but that was okay because even if my legs were invincible, my feet were not. In a fit of get-this-shopping-trip-over-with a year ago I bought sandals a couple sizes too large. The straps had now rubbed the tops of my feet raw, and as usual, my ankle was nice and garishly bloody. They are just short of smelling bad enough to require replacing, and I am looking forward to the day. I hobbled around for awhile, then descended to search for the bus back. I tried a likely spot, but got nothing but periodic facefulls of dust from passing cars. Where was the bus? I had a question, a problem, a need. I’ll give you one guess who showed up. I kid you not. Grandpa’s daughter showed me where to wait, and before long I was riding home, talking to a young Aussie couple on one side, and an expat English retiree on the other (who told me about the local woman and Maria). Even on a day where you almost wander off to your death, the Travel Gods may well be ready to help (with a little help from your Turkish grandpa). This was a sweet post! Complete with all the necessary parts for a compelling read. I simply couldn’t not read to the end! Awesome vistas at sunrise, mysterious yet compelling woodland trails, gnarly things, mistaken paths, helpful “angel” guides, respites of familiarity, physical exertion, obligatory “adventure wounds”, and a happy ending. What more could a reader ask for? Many thanks for sharing your travels. Wow, that makes it sound even better than it was to do. Many thanks for reading! Vagabond, Although for various reasons I occasionally miss an issue, I try not to, because I have found that your brief tales invariably sooth my aching soul. If I knew what was good for me (which I apparently do not) I might go buy a pair of oversized sandles and try to walk a trail or make a friend across a language barrier or take a brief moment with an animal that is not a common american squirrel. To me, you are a teacher, an adventurer, and a friend I have yet to meet. Blog on my friend. Blog on! Tur-kish Grand-pa! Tur-kish Grand-pa! Tur-kish Grand-pa! I can only say that next time I’m attending a Boston Bruins game, this is gonna be my chant! Weird stares be damned! I’m gonna sing it to the “sky”! Maybe, just maybe, Mr. Turkish Grndpa will “hear” me and his spirit will take a spin around the yard for just a moment…. Wouldn’t that be something? Shirley! You are hilarious! I agree with you 100%! And Mr Vagabond, surely, 😉 , of all the places you travel, Turkey is the best one to replace your over sized leather sandals. Come on! Say, when you mention a soundtrack, is it from your own device? Did you bring along music that makes you whole again? How ever can you choose? I always fail in predicting what I will want to listen to, but it sounds like you were spot on for this one. The Turk/Greek battle is unfathomably cruel and pointless. There are many tears in that corner of the world. I do indeed have a nicely loaded little piece of technology, which sometimes gets it right. The trick is finding something new on a semi-regular basis. Any recommendations? 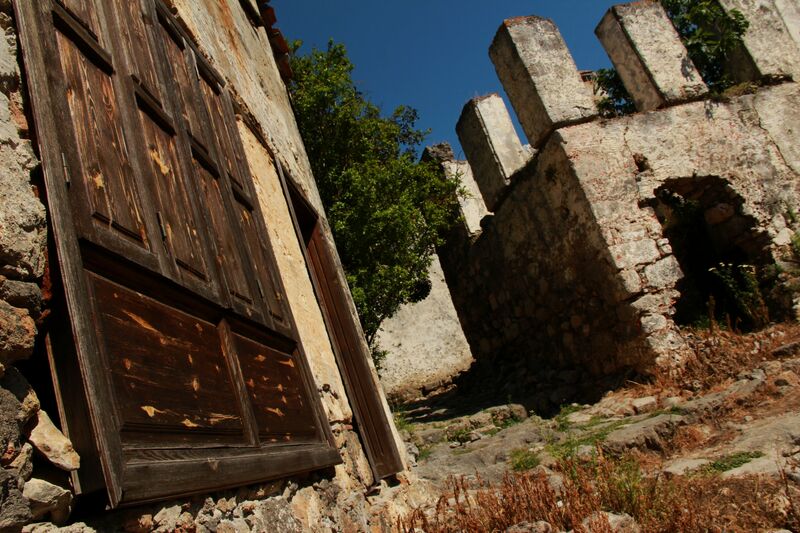 Yup, you can wander up into the ruins, although many of the alleys and sidestreets are pretty weed-choked. And oddly enough, people are living in some of them, not sure how that goes. Generators? Recommendations? Hmm, let’s take this offline to find out where our tastes coincide, and I will send you all of the music that has been alternately soothing and firing up my soul lately. Sounds good! But additional difficulties develop: my computer died. Shitcakes. I may have to wait for new tunes until next time I’m stateside, and that particular decision is imminent.